The hardest working taquero in the taco business can be found every weeknight on Eagle Rock blvd in Eagle Rock. His name is Leo and he has his wife Sonia run Leo's taco truck. Leo's is a local institution in Eagle Rock and a favorite among local Oxy students. So much so that the Oxy students made a movie about Leo's. Watch it here. Leo's is down with the digital age also. He has a website and myspace page. So now that we have all of the PR out of the way how are the tacos? Pretty darn good. The al pastor is special. The saucy juicy pork swims in flavor .It's the kind of taco you can easily get addicted to which explains the long lines and why I call Leo the hardest working taquero in the business. The man never stops working and his grill stays open from 8pm to 4am every night but Monday. Monday is Leo's day off. Tacos come with guacamole and salsa verde on the side. You can choose from asada, al pastor, pollo or veggie. On this night I went with asada, pastor and veggie because I know at least one vegetarian reads this blog.The veggie taco is sloppy but oh so tasty , especially with the salsa verde. The allure of Leo's aside from the food is the prices. In an age when your average burrito stand wants $5 for a burrito Leo gives us the $3 regular burrito (meat, beans,jack cheese, guacamole, pico de gallo) and the $2.50 veggie burrito. If you're a serious carnivore you can get the $4 all meat burrito. 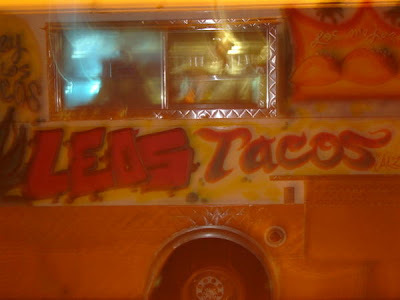 In eagle rock when it comes to late night street tacos it's either Leo's or Rambo's. If it's after the bars close there will be at least a 30 min wait at Leo's while the longest I've waited at Rambo's would be 10 minutes. Go at off peak hours (9ish) and try both. Shhh! If the veggie mafia finds out I read tacohunt they're gonna rub me out! ;) $2.50 for a veggie burrito is a good deal, I'm going to have to check this place out. Thanks for the tip! kepe up the excellent reporting ! i will definitely give this a try! i also recently discovered a new taco joint in burbank, it's called jalepeno's and it's in a small corner strip mall on burbank/victory, across from costco's and next to mcdonalds. their taco's are $1.89 but they're huge (they're like the equivalent of 2-3 tacos). their carnitas is crispy fired and their pastor is unbelievable! thanks bandini for another great post. now i know what i'm eating tonight! That looks good! I would say that it's the most attractive picture of a taco I've ever seen! It makes me wanna go and get myself a BIG taco! I found you from Joe Escalante's yelp...I'll be in LA on tuesday, where's the best taco in Beverly Hills? THAT LAST COMMENT WAS BY TOKS!! You have GOT to try the veggie quesedilla. I finally tried Leo's since a friend of mine was raving about it so much. They sucked so bad! It's a bunch of hype! Taco was boring, green salsa was watery, very bland, and not spicy enough. There's an asian-owned burrito place in burbank called Corner Cottage that has real Mexican salsa. Leo's salsa was a joke. I LOVE Leo!! He fed me all through college!! ...his chicken tacos are way better than Rambo's!! OMG...Leo's is the sh......I love it there. I'd wait as long as i have to...the longest at least an hour. Their ALL MEAT Asada with extra lime is the bomb. To all of you who havn't tried it you're missing out. I live in the OC and if my friends and I are craving it we'll drive out...that's how yummy in my tummy it is. I LOVE LOVE LOVE Leo's Tacos!!! Leo's is AMAZING!!! my life revolves around it! the economy is shite! went last night. Tacos were a 1.25, regular burrito were 4.50 (had not guac, or beans to my recollection) it was still good. but leo's was great cuz of the quality and competitive prices. no point in driving out to eagle rock now especially when there some bomb places in glendale, and surrounding areas closer to my house. 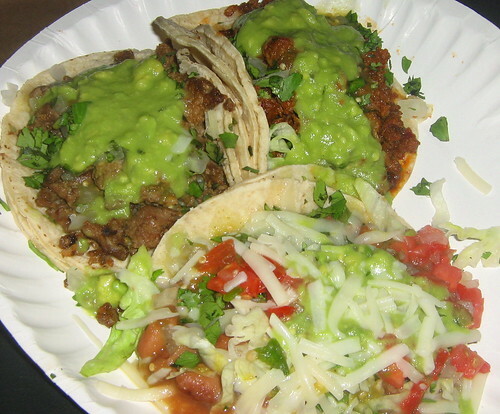 Try these tacos with www.stvendors.com you will have the best taco in LA!! !